HomeBlogNewsletter ColumnsWhy Are Denominations Dangerous? I recently attended a friend’s ordination ceremony who had graduated from seminary and became a minister. It’s not the first such occasion I attended, and it won’t likely be the last. It was, however, the first time I really listened to what took place. Integrated into the liturgy of the proceedings were a series of questions posed to the new minister. Early on one of the queries caught my attention. I’ll purposely not quote the question to hide the identity of the guilty denomination, but I will paraphrase it. In essence the denomination asked the young minister to pledge his loyalty to it and do his best to promote its mission locally and around the world. My friend’s expected response affirmed his willingness to do so. I don’t think I would have agreed to such a condition. Shouldn’t we pledge our loyalty to God and do our best to promote his mission locally and around the world? With 43,000 Protestant denominations, why does each one work so hard to preserve and promote its own brand of Christianity, often at the expense of others? Why not ditch the denomination and instead work hard to promote Christ? Assuming that by church those words refer to the universal church of Jesus, as opposed to the denomination, I see a contradiction of intent, that my friend promised to pursue two mutually exclusive goals. 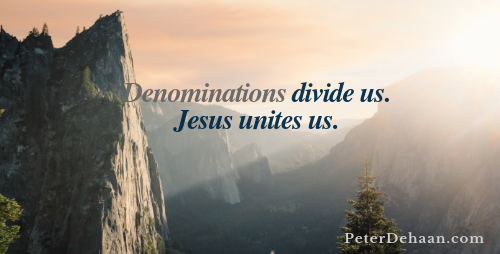 Our Protestant denominations divide us, whereas Jesus wants us to be one, to get along with each other, and to live in unity (John 17:21, 23). When we consider this carefully, our manmade denominations are the antithesis of the unity Jesus prays for. If my friend would indeed pursue unity as he promised, he should seek to dismantle the denomination, because its very existence opposes unity. I agree with the notion that people should need to demonstrate a strong knowledge of scriptures and preaching capability, but – maybe like you – am not convinced that “denominations” have an exclusive understanding of what sufficient knowledge and ability is. The Humble Ant is a Christian, family-operated organization intent on supporting parents, families, churches, Sunday School teachers, and Youth Group leaders in the development of Biblical, but non-denominational, illustrations for their Sunday School lessons or as part of their Family Worship. We’re pretty new, but create and share new devotional content a few times per month. We are interested in beginning to expand our reach through the support of similarly-minded blogs, websites, pages, boards and posts. We are very willing to reciprocate by adding a link or advertisement to your site on ours.